The range of speakers on the market is more than impressive. They vary in their size, options and, of course, price. 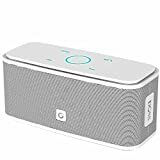 The last criterion is especially important for those who know the value of money or is not ready to spend a fortune on the best Bluetooth speakers. This review will prove that there is no point in spending a ton of money to get a top-notch Bluetooth speaker. You can enjoy a balanced sound for less than $50 and that’s not a myth. All you need to know is what features to pay attention to when choosing the best Bluetooth speakers under $50. Here are some basic tips. Bluetooth speakers can be of different sizes. But most of the customers expect them to be portable as the main advantage of such wireless speakers is that you can take them wherever you want. Obviously, they may be not as powerful as PC speakers or even bookshelf speakers but the question of quality isn’t always number one especially if you are planning a trip or a beach party. Still, not all Bluetooth speakers are compact. Some of them are rather bulky while others can boast of a pocket size. The same thing is with weight. Though, small speakers are sometimes heavier than big models. Always pay attention to the battery life of a speaker. It may vary from 5 hours to 24 hours of playtime. Note that the battery life mentioned in the list of speaker’s characteristics often goes together with the percentage of the volume used for performance. Just compare speakers with 8-hour battery life at 50% and 75% volume. Another thing to consider is the time of charging. It’s always better to have a speaker with quick recharging. The sound quality of the speaker depends on the power of drivers it is equipped with as well as radiators and processor. The higher quality they have the better performance you will get. Remember that high-grade speakers don’t have distortions at any volume and their sounding is well-balanced including crisp highs and deep bass. Seems impossible for Bluetooth speaker under $50? But there are models which can impress you with their sounding. Sure, it may be not as good as expensive speakers can offer but the quality of the audio is quite decent. It’s always great to have a water resistant, or preferably, waterproof speaker. Still, not all models have this feature. Some of them have only weather sealing while others include all types of protection. So, if you want to throw a party by the pool, then it’s better to choose a waterproof model. Though the name of Bluetooth speakers presupposes only wireless connectivity there are a lot of models which include 3.5 mm audio cable input as well. Such an option is great in case you have to pair your speaker with a non-Bluetooth device. This small box with a size of your palm will provide you with a high-quality sound with decent bass. Though JBL GO 2 is a wireless model it has also got an audio cable input. So, if Bluetooth isn’t available it won’t be a reason to panic. Another feature you will appreciate is its waterproof design. Having JBL GO 2 you can enjoy music resting by the pool or beach and stay calm when a splash of water covers your Bluetooth speaker. It also comes with a rechargeable Li-ion battery with 5 hours of playtime and a speakerphone. Easy paring is guaranteed as well. Though Anker Soundcore 2 can’t boast of such pocket size as JBL GO 2 has, it is a real monster among budget Bluetooth speakers. It is designed with dual neodymium drivers and an advanced digital signal processor. So, you may forget about sound distortions and enjoy music at any volume. 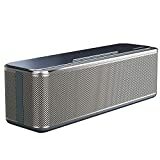 In addition, Anker Soundcore 2 is provided with bass up technology and a patented spiral bass port for impressive bass. This Bluetooth speaker also comes with weather sealing. It has ipx5-protection safeguards against dust, snow, rain and even spills. Still not impressed? Then what about its 5200mAh Li-ion battery that provides 24-hour playtime? One more Bluetooth speaker worth your attention is AOMAIS Sport II. It has a nice set of drivers that provide 20W full-bodied stereo sound. 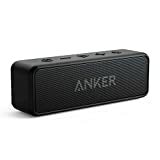 As well as Anker Soundcore 2 this speaker has a powerful bass and shows no distortions. Thus, you get enhanced but at the same time balanced sounding. AOMAIS Sport II has a waterproof design with the highest protection level of IPX7. It means that this speaker can stay underwater for about half an hour. Besides, it is dust proof, shock proof, mud proof and includes weather sealing. You will like its rugged design which prevents the speaker from scratches or any other types of damages during your indoor as well as outdoor adventures. AOMAIS Sport II also comes with 12 hours of playtime and inbuilt microphone for hands-free calling. 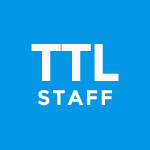 Looking for a voice-controlled speaker? 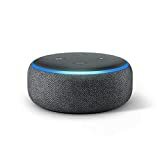 Echo Dot, namely its 3rd generation comes with Alexa. Just use your voice to learn about the latest news or to ask for music. Need to call? Alexa will also do that as there is an option of hands-free calling. Having such a speaker you can control all compatible smart home devices too. You can use Echo Dot to play your favorite tunes from Spotify, Pandora, Amazon Music or any other sound platform. Note that except for Bluetooth connection there is also a 3.5 mm audio cable. 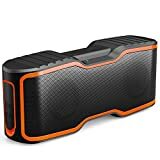 In case you like collecting unique things including devices such as Bluetooth speaker then pay attention at JBL Clip 2. Its design can’t be called a typical one due to its handle using which you can clip it to your belt without even noticing it as this speaker is quite small and light. JBL Clip 2 is IPX7 waterproof. As well as some pre-cited models this speaker isn’t only wireless but also wired as it comes with an integrated 2.5 mm audio cable. There is also a microphone for speakerphone calls. Thanks to its rugged design it is quite resistant to different types of damages. Another Bluetooth speaker that doesn’t cost hundreds of dollars but can provide you with great sound is AUKEY Bluetooth Stereo Speaker. It is designed with enhanced dual 8W drivers and dual passive radiators. Thanks to DSP (digital signal processor) that comes with MaxxBass technology you will get clear sound with great bass. There are two types of connectivity available: wireless and wired, so you may choose any one which you like. Its battery life isn’t the most powerful you have ever met but we believe 10 hours of playtime is quite enough especially if audio cable is also included. Anker Soundcore Motion Q is another portable Bluetooth speaker that doesn’t cost a ton of money. Thanks to its dual passive radiators and two full-range drivers this speaker provides full-bodied 360° sound. It has a compact but solid design with IPX7 protection able to prevent its Motion Q’s internal components from various damages even under water. This Anker model is easy to pair with the other devices and provides 10 hours of playtime. One of budget Bluetooth speakers with the best Bluetooth connectivity is OontZ Angle 3 Ultra. It provides fast Bluetooth connectivity at up to 100 ft range. Pairing is easy as well. You can also connect two OontZ Angle 3 ULTRA speakers together and get a great audio system with one speaker responsible for the left channel and the other one for the right. Such a combination will create excellent stereo separation. OontZ Angle 3 Ultra has a powerful battery that allows it to play up to 20 hours. What is more, it can boast of a robust body that comes with a weatherproof, splashproof and rainproof design. However, keep in mind that this model can’t work underwater even if submerged partially. There is also a 3.5mm audio cable for wired connection. This Bluetooth speaker supports Siri when connected to your iPad or iPhone as well. Thanks to its metallic design DOSS SoundBox looks stylish and attracts lots of customers. But if you think that behind a nice look and low price there is nothing special then you are mistaken. This Bluetooth speaker is equipped with 12W high-performance drivers that guarantee a high-definition stereo sound with an enhanced volume. It comes with a built-in Li-Ion 2200mAh rechargeable battery that provides 12-hour playtime and has a fast recharging. What is more, it supports Micro SD card and includes an audio cable. 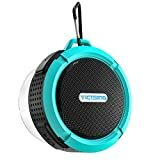 One of the cheapest Bluetooth speakers which can offer a top-notch performance and solid build quality is VicTsing Shower Speaker. Though it has only IPX5 protection level and isn’t waterproof, its silicon case makes it dustproof, shockproof and water resistant. As well as JBL Clip 2 this Bluetooth speaker has an aluminum hook for convenient carrying and attaching. Of course, its audio quality isn’t impressive, so don’t expect to hear immersive audio with crisp highs. Still, you can enjoy balanced stereo sound with full range output. Besides, it includes a hands-free function for calls. However, its battery life has only 6 hours of playtime. 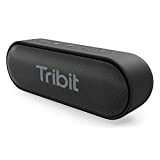 The last but not least on our list is Tribit XSound Go Bluetooth Speaker. It is designed with enhanced bass radiators and dual 6W power drivers for clear lifelike sound. Its Bluetooth connectivity covers the 66ft range and is quite stable. But you can always use 3.5mm cable if you need to pair it with non-Bluetooth devices such as a PC or TV. Note that Tribit XSound Go isn’t just water resistant. It’s completely waterproof, so you can take it for any water adventures. Add to this a compact portable design and it becomes your loyal companion in any life trips from sandy beaches of Thailand to craggy summits of the Scandes. Another great thing about this speaker is its long-lasting battery life. Tribit XSound comes with 24 hours of continuous use. Nowadays there is no need to spend hundreds of dollars to get a high-grade Bluetooth speaker. There are plenty of options for more than just affordable price. Sure, you can’t expect a 50-dollar speaker to show the best music performance ever. But you can always get a great sound for some outdoor fun.